Would you find feudalism in the Dark ages or Middle ages? When was Medieval Feudalism established in England? What was Feudalism in Medieval Times? However Feudalism was established in other parts of Europe prior to 1066 and the Norman Conquest of England. Therefore feudalism could be found during the Dark Ages in Europe but feudalism did not emerge in England until the Middle Ages. Feudalism in England was established by William the Conqueror and the Normans following the defeat of the English Anglo Saxons at the Battle of Hastings in 1066. The system and structure of feudalism had been well established in Europe for some time and the Normans imposed Medieval Feudalism in England following the Norman Conquest. When war erupted during the times of the Middle Ages troops were raised by the Feudal Levy when there was a 'Call to Arms'. Under the Feudal Levy men were required to fight for a limited period of 40 days - under certain circumstances this could be increased to 90 days. 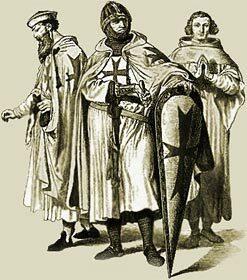 Medieval Nobles and lords of the Middle Ages were expected to provide trained soldiers to fight for the King and to provide clothes and weapons for the soldiers. The limited time requirement of the Feudal Levy was designed to ensure that the land would not suffer from neglect. The good thing about Medieval Feudalism was that is was possible for everyone to move higher up the ranks of the pyramid of power and this is what everyone aspired to do. Medieval Squires and Pages of the Middle Ages wanted to become knights. A Middle Ages Knight who proved valiant in battle or was successful at jousting in tournaments could become wealthy and ambitious because of Medieval Feudalism. His wealth could pay for a manor house or even a castle. If his importance in the land increased it became possible for him to join the nobility. The most powerful nobles aspired to be King - and the Medieval history of the Middle Ages under the feudalism pyramid describes such coups. The Medieval Times website provides interesting facts and information about the Middle Ages. The Medieval Times Sitemap provides full details of all of the interesting information, history and facts provided about the fascinating subject of the lives of people who lived during the Medieval times.